I was just recently at a friend’s house who is a big fan of Call of Duty Modern Warfare 2 and who had his Play Station hooked-up to an 80″ HD plasma screen TV with insanely powerful surround sound home theater system. I’ve actually played CoD 2 a few years ago and was very aware of CoD MW2 but hadn’t actually seen the game. Needless to say, I was slacked jaw and blown away from the total experience. The realistic nature of the game – the fact that you’re effectively controlling a character in a life-like movie setting is simply amazing. Given that our kids were running around, we played a few segments of the game that weren’t too bad in terms of violence and blood (which there’s a lot in the game). A couple of times, I let my son, who was dying to see it, actually play a few minutes here and there in sequences that were not any worse than a scene from the many action movies he’s seen like Hulk or Spider Man or Star Wars. 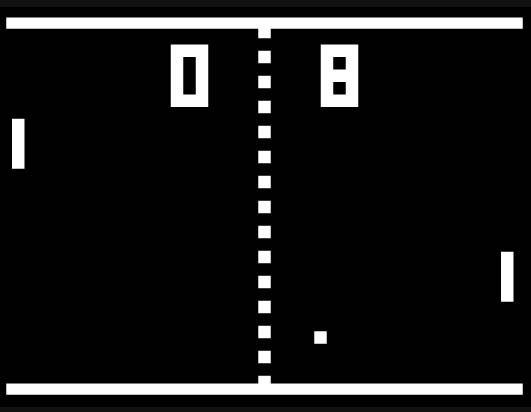 It then occurred to me that I was close to his age when Pong was first released. Pong, released in 1972 by Atari, is officially the first commercially successful video game, which ultimately led to the start of the video game industry. And it’s taken 38 years to get from that black and white paddle game to a completely photo realistic hyper-sensory experience that puts the player in the middle of intense fire fights and battles all over the world (Brazil, Russia, Middle East). The question that quickly followed my realization was what kind of games will my son and daughter be playing with their kids in 38 years or 28 years or 18 years? Given the non-linear acceleration of computational power and broadband speeds and inverse relationship between the cost and capacity of storage – it truly boggles my mind to try to imagine what kind of gaming experience our children will have. Fully immersive gaming closets with bio-feedback interfaces? In-brain gaming implants? Bio-chemical hallucinatory mind-trips with full body stimulation… avatars? What will cause our children to look back at games like Modern Warfare 2 with fond memories and chuckle at the primitive and crude graphics, controls and game play? What will they be experiencing that will make MW2 look like Pong? As a parent and a closet gamer – it’s a very fun, exhilarating but also kinda scary question to ponder.